I wonder if anyone else can relate to the experience of gathering fabric, admiring it, seeing all the pretty colours and then also seeing a great pattern where you could use those pretty colours all together? Well, that was my joy when I first saw 'Postcards from Sweden'. To me it had a harlequin flavour, you know the jester type people who dressed up in multi-coloured solids, wore a pointy hat with a bell on the end? Well, maybe my mind just works in weird ways! But when I saw that Sandra from MMM quilts had a quilt along with the pattern back in April, I thought I could join in. I managed to cut things out, but the deadline for completing kind of came and went and I thought perhaps I was one of the last, OK the very last, to finish mine. But maybe not? I didn't adhere strictly to the pattern, but added some of the fabrics I had. This seems to be a very versatile pattern that doesn't seem to care what colours are put together, they seem to work. And yes, the very observant will notice, that the binding isn't quite completed, but that's tonight's task. And it makes me happy. 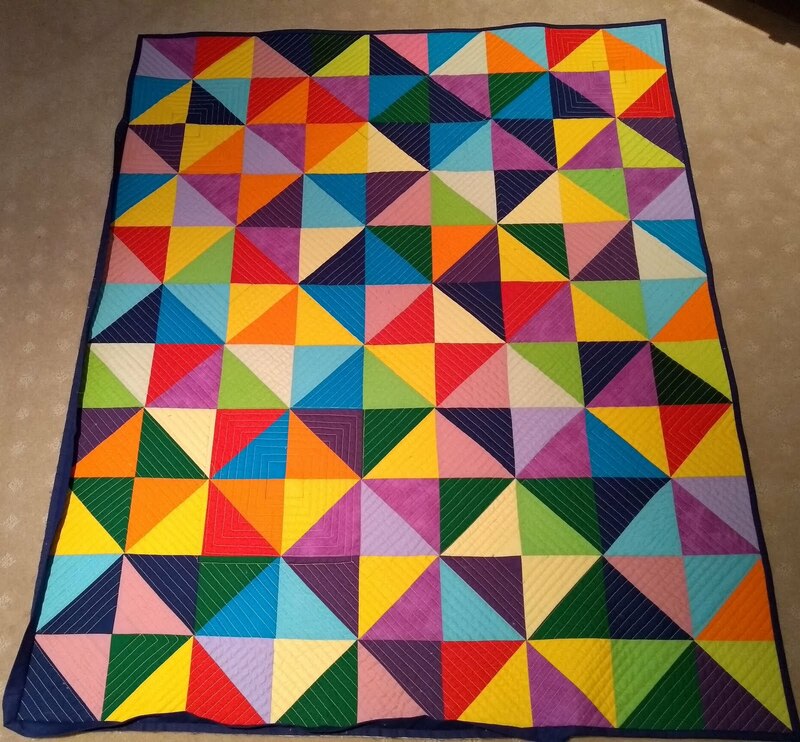 I saw that Louise from Quilt Odyssey had quilted hers in straight lines (I should have read more carefully I think hers were and inch apart, not the width of the quilting foot!) I thought that looked great. 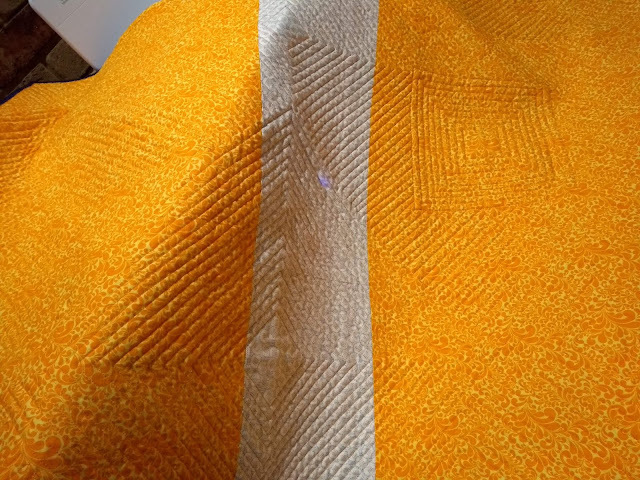 So I set to with bright orange thread and it worked very merrily. Whichever way they go, I had great fun doing them over this small quilt and it seemed to unify the whole and bring an added dimension to it. I did them diagonally on the quilt, to direct the eye towards the diagonal rows created by the colour of the bricks. This will definitely be one of my 'go to' patterns now, a lovely variety to the stipple I often do, or a paisley type leaf pattern. So that's what I've been up to lately, what about you? Oh my goodness, I love your Postcards quilt! And I get the harlequin idea, too! The quilting is great; I can't imagine how long that must have taken. That backing fabric is so cool! Love that cheddar color! After all that bright excitement, the calming colors of your next quilt are so lovely. I can see that pattern being a favorite, going together so quickly! Nice finishes! Thanks Wendy, maybe that's what we do instinctively, move from one colour palette to another and perhaps one quilting style to another too. OH! I love Harlequin! Wow, that's a lot of quilting. People tend to look at straight lines and go yup, and move along, never realizing HOW MUCH TIME they take... Floppy feathers are much faster, right? 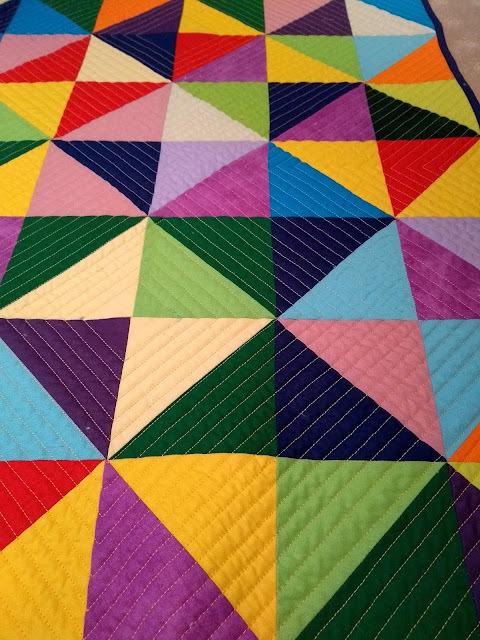 Gee that's the second floppy feathers quilting post I've read in a row! Feathers are my favourite, but I've never done these open ones, so I'll have to try. Love the bricks quilt pattern too. 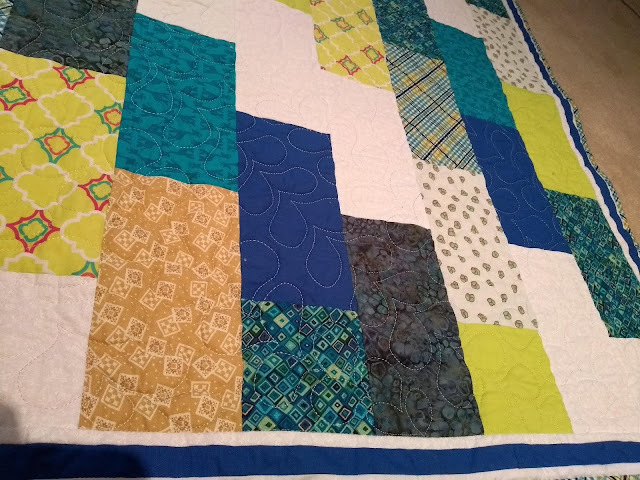 Thanks for quilting along, and no matter when you finish, it's a FINISH, yay! Thanks Sandra, have to say floppy feathers are much more fun than straight lines - bit like lessons in life? Thanks Louise, always enjoy seeing what creative things you get up to as well. Both quilts look great. Your quilting suits both. Thanks for linking up with Thank Goodness It's Finished Friday (TGIFF). Your quilts are great. I'm always on the lookout for "do-able" fmq designs...feathers intimidate me, but your floppy feathers are so cute and look a bit easier :) Thanks for sharing.. Thanks Karen, I recommend doodling a bit on paper first, then they seem to come quite easily - good luck. 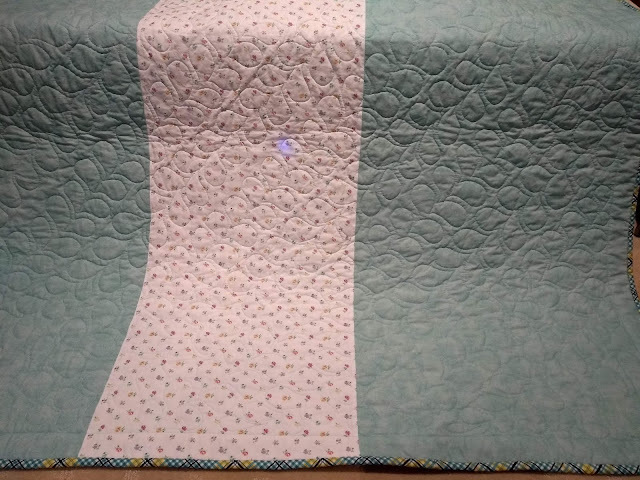 The straight line quilting is amazing. Such gorgeous colours! I love the way you had to make something completely different when you had finished. 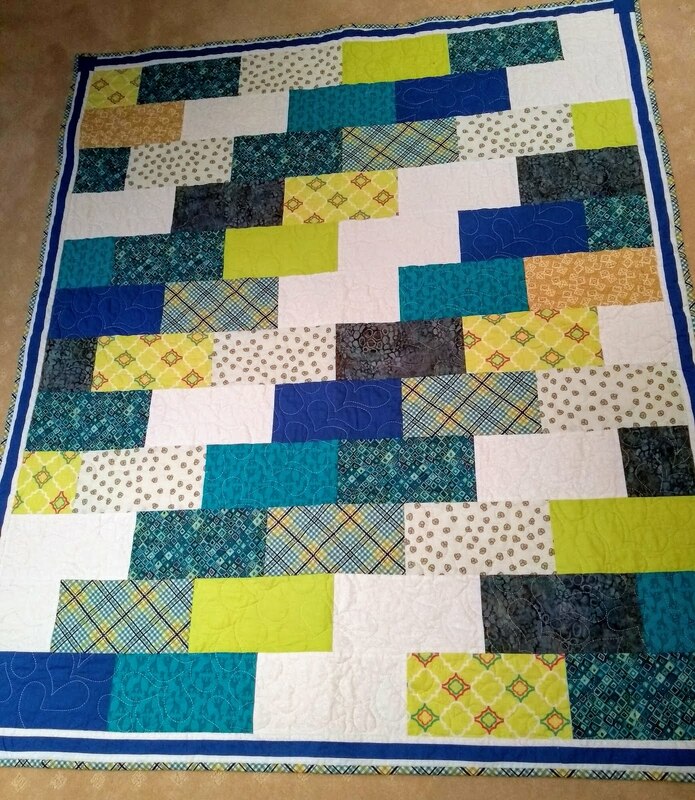 Your free motion quilting is so regular! Thanks Muv, I guess I've been doing the free-motion for a while now and its fun to try new shapes/designs.